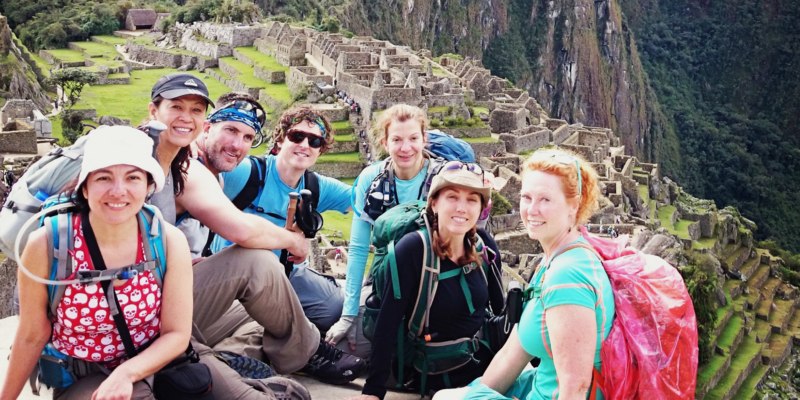 There are many different levels of Inca Trail trips you can take and in general, “you get what you pay for.” But what’s right for you? You can go from bare bones trips where corners can be cut (with substandard equipment, poor food, low wages for staff, no training, etc.) to luxury trips where many over-the-top, and frankly, unnecessary, experiences can be added. Zephyr’s Inca Trail Treks fall somewhere in the middle of that range. We like a level of comfort but don’t want to shield people from the culture of a place by staying in five-star luxury hotels that bear little resemblance to the place we are in. When deciding on a tour operator for your trek, there are additional factors you may want to consider. You should confirm all the details with your tour operator. Is it a private trek only for you and your group or not? Some companies will combine you with other people you don’t know to lower their overall cost. What level of comfort is right for you? The standard for hotels and even camping gear can vary wildly. Some meals may not be included. Food on the trail may be of a different quality or quantity. Make sure to ask about the staff who will be with you on your trek. Are they brand new or experienced? Do they speak English? Can they tell you about the flora and fauna on the trail or the history of the Incans? Are they trained well, especially when it comes to safety in the mountains, or handling your food, or in an emergency situation? Are they well compensated? The biggest difference between a responsible company and an irresponsible one is how they look after their porters and staff on the trek. Transportation can vary. Are the shuttles private or shared? What is the class of the trains you take? Are you able to ask detailed questions of your tour company if you have them? Some companies have people answering the phone who just read from scripts and may not be able to answer your questions to the detail you’re looking for. If you book a private Inca Trail trek with us (minimum of two people), yours will be a truly private trip with only the members of your own group. For hotels, we prefer to stay in nice, locally-owned boutique hotels to increase our contact with the local culture, to keep the price of the tour more affordable, and to have our dollars support the local economy. We have hired our local porters and staff from the same Quechua village for many years. Our guides and staff are well-trained and have led people on this trail hundreds of times. Because of this, we have a very high success rate on the safe completion of our treks. Our Inca Trail trips include private shuttles and we opt for the nicer Vistadome train. The Vistadome train usually offers large windows for viewing the beautiful Andes surrounding the valley, snacks and drinks, a fashion show of alpaca wearables, and a short cultural dance and music. Kind of cheesy but kind of fun! And as for being able to answer your detailed questions, you have a great resource in me! I have done this trek myself a couple of times and have set up dozens and dozens of these treks with great results. I will hold a pre-trek conference call with your group a month or so prior to your departure to go over detailed information with you about your trip. We have it pretty well fine-tuned at this point! 🙂 I urge you to give me a call at 888-758-8687 or shoot me an email (kris@zephyradventures.com) with any questions you have about the Inca Trail or any of our tours.